Diamonds from the Deep: How Do Diamonds Form in the Deep Earth? Carbon is one of the most important elements on our planet, which led the Geological Society of London to name 2019 the Year of Carbon. Diamonds are a main host for carbon in the deep earth and also have a deeper origin than all other gemstones. Whereas ruby, sapphire, and emerald form in the earth’s crust, diamonds form many hundreds of kilometers deep in the earth’s mantle. Colored gemstones tell scientists about the crust; gem diamonds tell scientists about the mantle. This makes diamonds unique among gemstones: Not only do they have great beauty, but they can also help scientists understand carbon processes deep in the earth. Indeed, diamonds are some of the only direct samples we have of the earth’s mantle. But how do diamonds grow in the mantle? While Hollywood’s depiction of Superman squeezing coal captured the public’s imagination, in reality this does not work. Coal is a crustal compound and is not found at mantle pressures. Also, we now know that diamond does not prefer to form through direct conversion of solid carbon, even though the pressure and temperature conditions under which diamond forms have traditionally been studied experimentally as the reaction of graphite to diamond. Generally, two conditions are needed for diamond formation: Carbon must be present in a mantle fluid or melt in sufficient quantity, and the melt or fluid must become reduced enough so that oxygen does not combine with carbon (see below). But do diamonds all grow by the same mechanism? What does their origin reveal about their growth medium and their mantle host rock? Surprisingly, diamonds do not all form in the same way, but rather they form in various environments and through varying mechanisms. Through decades of study, we now understand that diamonds such as the rare blue Hope, the large colorless Cullinan, and the more common yellow “cape” dia­monds all have very different origins within the deep earth. Diamond is a metasomatic mineral that forms during migration of carbon-bearing fluids, which means that it forms from fluids and melts that move through the mantle. Diamonds can form in both peridotite and eclogite (box A) in the cratonic lithospheric mantle, as well as their higher-pressure equivalents in the much deeper transition zone and lower mantle (box B). Regardless of a diamond’s formation depth, many diamond fluids and melts appear to be related to the recycling of surficial material into the deep earth or to deep melting processes when tectonic plates split apart, or rift, to form new oceans. Both processes occur as part of the geologic cycles that accompany plate tectonics or, in ancient times, some type of pre-plate tectonics. Peridotite. Peridotite is the predominant rock type in the mantle. It contains the minerals orthopyroxene, clinopyroxene, and olivine (figure A-1). Peridotite also contains an aluminous phase that can be either spinel or garnet, depending on depth. At the higher pressure conditions in the diamond stability field, the aluminous phase is always garnet (figure A-1). Peridotite melts to form basalt at mid-ocean ridges and ocean islands. This melting removes the basaltic melt from peridotite, leaving the residual peridotite depleted in elements such as Ca, Al, and Fe. This is because the melt moves upward to dikes that eventually feed shallow magma chambers. Lherzolite, the most fertile peridotite, has not undergone significant melt depletion and will contain some combination of the minerals listed above. With high proportions of melt depletion, clinopyroxene is eventually exhausted in the residual peridotite, resulting in the clinopyroxene-free rock known as harzburgite. With around 40–50% melting, orthopyroxene is also exhausted and olivine dominates the peridotitic assemblage. After these high degrees of melting where most of the Ca, Al, and Fe have been lost, the residual peridotite becomes the most depleted dunite. Importantly, both depleted harzburgite and dunite can be re-enriched by passing melts that could reintroduce many of these minerals and convert depleted peridotite back to fertile lherzolite. Figure A-1. Red-purple garnet (with Cr-pyrope compositions) and bright green clinopyroxene (with Cr-diopside compositions) separated from a crushed peridotite rock. Photos by Karen Smit/University of Alberta. Figure A-2. Bimineralic eclogite containing pale green clinopyroxene and orange-red garnet (Victor mine, Canada). This eclogite rock was sawed into a thin section (30 µm thick) and polished so that it could transmit light and be studied under a microscope. Photo by Karen Smit/University of Alberta. Eclogite. Eclogite is another rock type in the lithospheric mantle, a bimineralic rock consisting of a sodium-rich clinopyroxene (known as omphacite) and garnet with pyrope (Mg-rich), grossular (Ca-rich), and almandine (Fe-rich) components (figures 3 and A-2). There are two main models for the origin of eclogites in the lithospheric mantle: as high-pressure mantle melts or as former oceanic crust that has been recycled back into the mantle through subduction (Jacob, 2004). Despite their scarcity in the lithospheric mantle (estimated to be less than 1%), eclogites are often sampled by kimberlites and, due to their frequent recycled origin, can provide important insights into the role of subduction in the assembly of cratonic keels and recycling of surficial components into the deep earth. How Do Lithospheric Diamonds Form? Lithospheric diamonds (box B) often contain detectable nitrogen, implying that they crystallize from carbon- and nitrogen-bearing (C-N-bearing) fluids. Through the study of diamonds from many different localities, we now know that there are subtle differences in the compositions of these C-N-bearing fluids and melts. These differences manifest as changes in the type of carbon and nitrogen compounds contained in these fluids. “Oxidized” hydrous fluids and melts can contain CO3, CO2, and N2, whereas more “reduced” hydrous fluids contain CH4, NH3, and minor H2. BOX B: WHERE DO DIAMONDS FORM IN THE EARTH? Natural diamonds typically form 150–200 km below the surface of the earth. Diamond formation does not occur everywhere at these depths, but only below the oldest continents that have been stable for billions of years; these areas are known as cratons (see figure 2 in Summer 2018 Diamonds from the Deep). This is because these old cratons all have thick continental roots with cool temperature profiles conducive to diamond formation that geologists term “continental lithospheric mantle.” Diamonds that form within these continental roots are known as lithospheric diamonds and are carried up to the surface of the earth by rare volcanic eruptions known as kimberlites. Other diamonds form much deeper in the earth, in sublithospheric regions of the mantle, below these continental roots. So-called superdeep diamonds form at depths much greater than 200 km, in areas of the mantle known as the transition zone (410 to 660 km below the earth’s surface) and lower mantle (>660 km). After formation they are transported to shallower depths in the mantle, likely through mantle convection cells, and then also brought to the surface by kimberlite eruptions. Earth’s mantle convection associated with plate tectonics is responsible for both the availability of fluids necessary to form diamonds and the return of diamonds to the surface. Ocean floor is thrust deep into the mantle by the process known as subduction and carries diamond-forming fluids in its seawater-altered minerals and rocks. Mantle convection return flow also causes hot mantle to rise to shallower levels and melt, generating the kimberlites that deliver diamonds to the surface. Figure 1. We now have evidence for a wider range of diamond source fluid compositions in both the lithosphere and sublithosphere that do not include any carbonate components. Both peridotitic and eclogitic diamonds from the lithosphere are now known to also precipitate from non-carbonate-bearing fluids. The Marange cuboctahedral diamonds formed from water-rich fluids that contain both methane and carbon dioxide (Smit et al., 2016), and the Zimmi eclogitic diamonds crystallized from water-rich fluids that are more reduced and contain significant methane (Smit et al., 2019), similar to fluids indicated for peridotitic diamonds from the Cullinan mine (Thomassot et al., 2007). Photos by Joshua Balduf and Karen Smit/GIA. Traditional models for diamond formation from fluids in the mantle invoke either carbonate (CO3) reduction or methane (CH4) oxidation to remove the elements bonded to carbon. Both these mechanisms require some oxygen exchange with the surrounding rocks—peridotite or eclogite (box A)—at the site of diamond precipitation so that elemental carbon can be produced to crystallize diamond. Sometimes peridotite has a limited capacity to exchange oxygen, and we now know that cooling of hydrous fluids containing methane (CH4) and carbon dioxide (CO2) is an alternative way to precipitate diamonds in these rocks (figure 1; Luth and Stachel, 2014; Smit et al., 2016; Stachel et al., 2017). Figure 2. A fibrous cubic diamond (1.3 × 1.3 mm) from Wawa (Superior craton, Canada) that has been cut through the middle and polished into a double-sided plate (right). Fibrous diamonds such as this example typically contain a darker rim of fluid inclusions that have compositions ranging between carbonate-rich, saline-rich, and silica-rich. Fluids similar to those in fibrous diamonds have been found along twin planes in gem-quality diamonds from Voorspoed and Venetia (Jablon and Navon, 2016). Photos by Evan Smith/University of British Columbia. Unfortunately, gem-quality diamonds almost never contain any trapped source fluids that can directly indicate how they formed. However, there are so-called fibrous dia­monds (figure 2) that grow much more rapidly than gem-quality diamonds, and even coat earlier gem diamond cores, allowing them to trap abundant fluids. Fibrous diamonds from all over the world, including Canada, West Africa, Siberia, and South Africa, have compositions that are different mixtures of three end-member fluid compositions: carbonate-like, silica-rich, or salty (e.g., Navon et al., 1988; Izraeli et al., 2001, 2004; Schrauder and Navon, 1994; Smith et al., 2012; Weiss et al., 2013; Timmerman et al., 2018). The origins of fibrous diamonds and their fluids are still debated. Some researchers argue that fibrous diamonds may be related to the kimberlite magmas that transport diamonds to the surface. If so, fibrous diamonds could form right before the kimberlite eruption to the earth’s surface, which would make them much younger than many gem-quality diamonds that may have resided in the mantle for millions to billions of years. One study, however, linked the full range of fluids in some fibrous diamonds from northern Canada to subducting oceanic lithosphere, concluding that the original subducting fluid was related to >200-million-year-old recycled sea water (Weiss et al., 2015). This implies that some fibrous diamonds could have longer mantle residence times and are not necessarily always related to kimberlite eruption. Fluids similar to those in fibrous diamonds have been found along twin planes in rare gem-quality diamonds from South Africa, indicating that some gem-quality diamonds may have similar formation conditions to fibrous diamonds (Jablon and Navon, 2016). However, fluid inclusions in gem-quality diamonds are actually very rare, and source compositions and the nature of reactants to make diamond must be inferred from the covariation of carbon isotope composition and nitrogen content, either in individual diamonds or diamond suites (Deines, 1980; Stachel et al., 2009). These carbon isotope studies suggest that gem-quality diamonds may form through varying mechanisms, though they typically involve hydrous carbon-bearing fluids that also contain oxygen and hydrogen (either as CO3, CO2, or CH4). Carbon isotope studies can infer whether a diamond source fluid is “oxidized” or “reduced” (see above) but do not reveal the fluid’s full elemental composition. Diamonds are comprised mostly of carbon, and any other elements present in the diamond are normally at incredibly low abundances that are difficult to measure. For this reason, trace element data for gem-quality diamonds are only now being realized with improvements in analytical sensitivity. But the available trace element data for gem-quality diamonds do appear to show many compositional similarities to fluid-rich fibrous diamonds (Krebs et al., 2019), further suggesting that fibrous and gem-quality diamonds crystallize from similar types of mantle fluids. So-called superdeep diamonds that form in the sublithospheric mantle (box B) contain very little nitrogen and are relatively pure, making them nearly colorless (e.g., CLIPPIR diamonds such as the Cullinan diamond and the Constellation diamond from Karowe mine in Botswana; Smith et al., 2016). Some superdeep diamonds are plastically deformed, making them pink or brown (e.g., diamonds from the Juína area in Brazil). Rarely, they can contain some boron imparting a blue color (e.g., the Hope diamond; Smith et al., 2018). Based on studies of inclusion-bearing superdeep diamonds, we now know that they cannot all form in the same environment and that they must crystallize from a wide variety of source fluids and melts that all relate to different aspects of very deep subduction (box B). Figure 3. Before 2016, the majority of diamonds were thought to crystallize from fluids and melts that contained carbonate. For example, the diamonds contained in Jericho eclogites (Slave craton, Canada; left) have covariations in carbon isotopic composition and nitrogen content that indicate carbonate-rich source fluids/melts (Smart et al., 2011). Similarly, the trace element compositions of inclusions in Juína superdeep diamonds (right) also indicate their formation from carbonate-rich fluids or melts in the deep mantle (Walter et al., 2008; Bulanova et al., 2010; Thomson et al., 2016). Photos by Katie Smart/University of Alberta and Galina Bulanova/University of Bristol. Figure 4. Although some superdeep diamonds have been shown to crystallize from carbonate-rich melts (figure 3), there are also some rare superdeep diamonds that crystallize from boron-rich fluids and reduced metallic melts, both variably associated with subducted oceanic lithosphere (Smith et al., 2016, 2018). On the left is a 29.62 ct boron-containing rough blue diamond, and on the right is the 812.77 ct rough Constellation diamond, which contained metallic inclusions. Photos by Jian Xin (Jae) Liao/GIA. Many superdeep diamonds, such as those from the Juína and Machado River areas in Brazil, preserve inclusion evidence for their crystallization from carbonate-rich fluids (figure 3; Walter et al., 2008; Bulanova et al., 2010; Burnham et al., 2016; Thomson et al., 2016). These CO3-rich source fluids likely derive from oceanic lithosphere that was deeply subducted into the mantle transition zone (box B). CLIPPIR diamonds (figure 4) are now also known to crystallize from metallic melts in the deep earth that are associated instead with reduced carbon (CH4) and hydrogen (Smith et al., 2016). These diamonds have carbon isotopic compositions that are unlike those expected for the mantle, but rather indicate an ultimate source for the carbon in the oceanic lithosphere, as do other superdeep diamonds. The third kind of superdeep diamond, boron-containing blue diamonds, are also related to deeply subducted oceanic lithosphere (figure 4; Smith et al., 2018). In this case, however, the source for the boron-containing fluids is likely to be altered peridotite in the deeper portions of the subducted lithosphere. Our understanding of the fluids from which diamonds form is improving with advances in the sensitivity of analytical techniques. Most diamonds are only comprised of carbon, with less than a few parts per million of nitrogen, boron, and other trace elements. Many elements that scientists are interested in detecting in diamond are currently not able to be measured accurately. With improved analytical techniques that can measure the very low concentrations of trace elements in diamonds, we may be able to better understand the different origins for diamond source fluids. Future work will also reveal how the different diamond-forming environments relate to each other. Our understanding of the origin of lithospheric diamond source fluids is better developed than it is for sublithospheric diamonds. This is because they contain much more nitrogen that can be studied along with carbon, and sometimes they are found still trapped within their peridotite or eclogite host rocks (figure 3). Since superdeep diamonds contain little or no nitrogen, and are never found within their original superdeep mantle host rocks, they provide less information about the geological conditions by which they formed. We do know, however, that the carbonate-rich fluids, metallic melts, and boron-rich fluids in superdeep diamonds all relate in some way to deeply subducted material from the earth’s oceanic lithosphere. But the challenge remains for geologists to predict where these domains, all with different oxidation states, occur in the deep earth. Current diamond exploration models have a near-exclusive focus on lithospheric diamonds, so geologists still need to do some work to figure out how to explore for potentially high-value superdeep diamonds. Karen V. Smit is a research scientist at GIA in New York. Steven B. Shirey is a senior scientist at the Carnegie Institution for Science in Washington, DC. Bulanova G.P., Walter M.J., Smith C.B., Kohn S.C., Armstrong L.S., Blundy J., Gobbo L. (2010) Mineral inclusions in sublithospheric diamonds from Collier 4 kimberlite pipe, Juina, Brazil: subducted protoliths, carbonated melts and primary kimberlite magmatism. Contributions to Mineralogy and Petrology, Vol. 160, No. 4, pp. 489–510. Burnham A.D., Bulanova G.P., Smith C.B., Whitehead S.C., Kohn S.C., Gobbo L., Walter M.J. (2016) Diamonds from the Machado River alluvial deposit, Rondonia, Brazil, derived from both lithospheric and sublithospheric mantle. Lithos, Vol. 265, pp. 199–213. Deines P. (1980) The carbon isotopic composition of diamonds: relationship to diamond shape, colour, occurrence and vapour deposition. Geochimica et Cosmochimica Acta, Vol. 44, pp. 943–961. Izraeli E.S., Harris J.W., Navon O. (2001) Brine inclusions in diamonds: a new upper mantle fluid. Earth and Planetary Science Letters, Vol. 187, No. 3-4, pp. 323– 332. Izraeli E.S., Harris J.W., Navon O. (2004) Fluid and mineral inclusions in cloudy diamonds from Koffiefontein, South Africa. Geochimica et Cosmochimica Acta, Vol. 68, No. 11, pp. 2561–2575. Jablon B.M., Navon O. (2016) Most diamonds were created equal. Earth and Planetary Science Letters, Vol. 443, pp. 41–47. Jacob D.E. 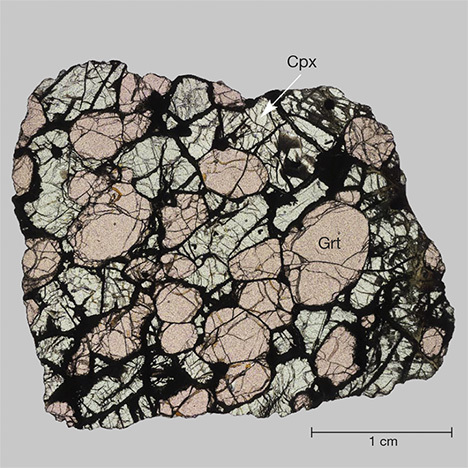 (2004) Nature and origin of eclogite xenoliths from kimberlites. Lithos, Vol. 77, No. 1-4, pp. 295–316. Krebs M.Y., Pearson D.G., Stachel T., Laiginhas F., Woodland S., Chinn I.L., Kong J. (2019) A common parentage – low abundance trace element data of gem diamonds reveals similar fluids to fibrous diamonds. Lithos, Vol. 324-325, pp. 356–370. Luth R.W., Stachel T. (2014) The buffering capacity of lithospheric mantle: implications for diamond formation. Contributions to Mineralogy and Petrology, Vol. 168, No. 5, p. 1083. Navon O., Hutcheon I.D., Rossman G.R., Wasserburg G.J. (1988) Mantle-derived fluids in diamond micro-inclusions.Nature, Vol. 335, No. 6193, pp. 784–789. Schrauder M., Navon O. (1994) Hydrous and carbonatitic mantle fluids in fibrous diamonds from Jwaneng, Botswana. Geochimica et Cosmochimica Acta, Vol. 58, No. 2. Smart K.A., Heaman L.M., Chacko T., Simonetti A., Kopylova M., Mah D., Daniels D. (2009) The origin of high-MgO diamond eclogites from the Jericho Kimberlite, Canada. Earth and Planetary Science Letters, Vol. 284, No. 3-4. Smart K.A., Chacko T., Stachel T., Muehlenbachs K., Stern R.A., Heaman L.M. (2011) Diamond growth from oxidized carbon sources beneath the Northern Slave Craton, Canada: A d13C-N study of eclogite-hosted diamonds from the Jericho kimberlite. Geochimica et Cosmochimica Acta, Vol. 75, No. 20, pp. 6027–6047. Smit K.V., Shirey S.B., Stern R.A., Steele A., Wang W. (2016) Diamond growth from C-H-N-O recycled fluids in the lithosphere: evidence from CH4micro-inclusions and d13C-d15N-N content in Zimbabwe mixed-habit diamonds. Lithos, Vol. 265, pp. 68–81. Smit K.V., Stachel T., Luth R.W., Stern R.A. (2019) Evaluating mechanisms for eclogitic diamond growth from reduced fluids: an example from Neoproterozoic Zimmi diamonds (West African craton). Submitted to Chemical Geology. Smith E.M., Kopylova M.G., Nowell G.M., Pearson D.G., Ryder J. (2012) Archean mantle fluids preserved in fibrous diamonds from Wawa, Superior craton. Geology, Vol. 40, No. 12, pp. 1071–1074. Smith E.M., Shirey S.B., Nestola F., Bullock E.S., Wang J., Richardson S.H., Wang W. (2016) Large gem diamonds from metallic liquid in Earth’s deep mantle. Science, Vol. 354, No. 6318, pp. 1403–1405. Smith E.M., Shirey S.B., Richardson S.H., Nestola F., Bullock E.S., Wang J., Wang W. (2018) Blue boron-bearing diamonds from Earth’s lower mantle. Nature, Vol. 560, pp. 84–87. Stachel T., Harris J.W., Muehlenbachs K. (2009) Sources of carbon in inclusion-bearing diamonds. Lithos, Vol. 112S, pp. 625–637. Stachel T., Chacko T., Luth R.W. (2017) Carbon isotopic fractionation during diamond growth in depleted peridotite: Counterintuitive insights from modelling water-maximum CHO fluids as multi-component systems. Earth and Planetary Science Letters, Vol. 473, pp. 44–51. Thomassot E., Cartigny P., Harris J.W., Viljoen K.S. (2007) Methane-related diamond crystallisation in the Earth’s mantle: Stable isotope evidences from a single diamond-bearing xenolith. Earth and Planetary Science Letters, Vol. 257, pp. 362–371. Thomson A.R., Kohn S.C., Bulanova G.P., Smith C.B., Araujo D., Walter M.J. (2016) Trace element composition of silicate inclusions in sub-lithospheric diamonds from the Juina-5 kimberlite: Evidence for diamond growth from slab melts. Lithos, Vol. 265, pp. 108–124. Timmerman S., Jaques A.L., Weiss Y., Harris J.W. (2018) N-d13C-inclusion profiles of cloudy diamonds from Koffiefontein: Evidence for formation by continuous Rayleigh fractionation and multiple fluids. Chemical Geology, Vol. 483, pp. 31–46. Walter M.J., Bulanova G.P., Armstrong L.S., Keshav S., Blundy J.D., Gudfinnsson G., Lord O.T., Lennie A.R., Clark S.M., Smith C.B., Gobbo L. (2008) Primary carbonatite melt from deeply subducted oceanic crust. Nature, Vol. 454, pp. 622–625. Weiss Y., Griffin W.L., Navon O. (2013) Diamond-forming fluids in fibrous diamonds: The trace-element perspective. Earth and Planetary Science Letters, Vol. 376, pp. 110–125. Weiss Y., McNeill J., Pearson D.G., Nowell G.M., Ottley C.J. (2015) Highly saline fluids from a subducting slab as the source for fluid-rich diamonds. Nature, Vol. 524, p. 339. The first installment of G&G’s newest section explores how natural diamonds shed light on the mystery of water found in Earth’s deep mantle. Examines the last two decades’ advances in analyzing and understanding the formation of natural diamonds, and their relation to the earth’s formation.